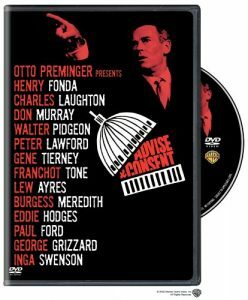 In short, Advise and Consent is one of the best political intrigue movies that I’ve ever seen. The basic plot involves a very ill President of the United States (Franchot Tone) who wants to nominate for Secretary of State a senator. A man with a small secret in his past (played beautifully by Henry Fonda – a great performance). The Senate Majority Leader (a wonderful performance by Walter Pidgeon) tries to line up the votes. But he’s being undercut by a zealous young senator (Don Murray). And, on the “other side of the aisle” by a Southern senator (played by Charles Laughton in his final performance), a man who views himself as a kingmaker, using the other senators and people like pawns on a chess board. Advise and Consent uses the background of the Communist-hunting of the McCarthy era quite well. It also demonstrates that even the people who consider themselves upright just might have something in their background that they want to remain hidden. I would be remiss to not mention Charles Laughton’s performance here. I’ve seen him play roles ranging from the sympathetic Quasimodo in The Hunchback of Notre Dame, the amoral Dr. Moreau in Island of Lost Souls, the unyielding Captain Bligh in Mutiny on the Bounty, and even a comic role Abbott and Costello Meet Captain Kidd. But I’ve never seen a better performance. His character, although on the surface a likable older Southern gentleman, is more like Shakespeare’s Iago. Even so, as the ending demonstrates, he has both character and a conscience and is not a villain. In fact, one of the most interesting things about Advise and Consent is that, technically, there is no villain. There are simply people with strong beliefs. Each person is offered the chance to explain their positions to each other, as well as the audience. And there are plenty of moments for the human element as well. One such moment is Henry Fonda trying to explain his situation to his young son. Another is the wife of a senator trying to deal with “anonymous” phone calls, in an attempt to blackmail the senator. The final fifteen minutes of the film are both riveting and surprising — I won’t spoil it for you other than to highly recommend that you see Advise and Consent for yourself. Otto Preminger expanded his vision in the 1960s with a whole series of ambitious, expansive dramas with huge casts and big themes. Advise and Consent, an examination of deal making, party politics, and congressional diplomacy in Washington’s legislative halls (based on the novel by Allen Drury), is one of his best. Preminger broke the blacklist with his previous film, Exodus, and it rings through in this drama about a controversial nominee for secretary of state (a confident, stately Henry Fonda) accused of being a Communist. 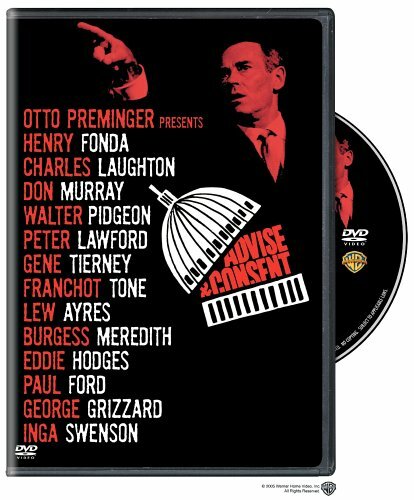 The nomination process becomes the center ring of the political circus, with fidgety accuser Burgess Meredith in the spotlight; devious, silver-tongued Charles Laughton cracking the whip as a southern senator with a grudge against Fonda; and party whip Walter Pidgeon lining up votes behind the scenes. Gripping, classic Washington drama dealing with the power plays that erupt when a controversial politician is nominated for Secretary of State. Director Otto Preminger elicits superb performances from an all-star cast that includes Henry Fonda, Charles Laughton, Burgess Meredith, Gene Tierney, and Peter Lawford. 138 min. Widescreen (Enhanced); Soundtrack: English Dolby Digital mono; Subtitles: English, Spanish, French; audio commentary; theatrical trailer.